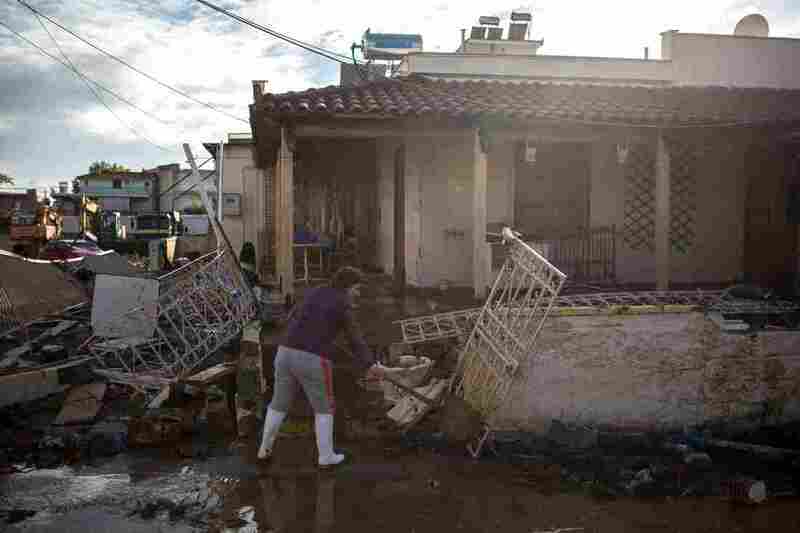 Greece Was Hit By Storm Some Called A 'Medicane.' What's That? : The Two-Way European weather sites posted imagery showing the swirling wind patterns and a waterspout over the Mediterranean. The low pressure system shared characteristics of tropical cyclones. Flash floods killed at least 20 people in Greece, in a storm some were calling a "medicane." A woman cleans mud in front of a house in the town of Mandra, northwest of Athens, on Friday. Flash floods struck Greece last week, killing at least 20 people and damaging homes and businesses. Greek's prime minister declared a period of national mourning. Towns on the outskirts of Athens were hardest hit. In the town of Mandra, 12 people died. "Everything is lost," said Mandra mayor Yianna Krikouki, according to The Guardian. "The disaster is biblical." European weather sites shared imagery showing the swirling wind patterns of the storm and a waterspout over Greece. And some called the storm a "medicane," meaning a Mediterranean hurricane. Atmospheric scientists at MIT and a Spanish university defined medicanes in a 2013 paper as "extreme cyclonic windstorms morphologically and physically similar to tropical cyclones." The authors noted that in addition to its maritime origin, the storms appear in satellite images as "vigorous, highly concentric cloud bands wrapped around a central eye" and "sea-to-air heatfluxes and latent heat release within the core of the storm." "Medicanes aren't considered full-fledged tropical systems, since the waters of the Mediterranean aren't extensive or warm enough to sustain a true hurricane. And despite the implication embedded in the name, very few medicanes achieve sustained winds as strong as a Category 1 hurricane. However, it's quite possible for an existing center of low pressure in the Mediterranean to briefly take on tropical characteristics, including a symmetric structure and a small core of warm air. [M]edicanes rely on colder air aloft, typically brought in as part of an upper-level low that decays over the Mediterranean. Wind shear relaxes as the upper low decays, and the contrast between the cold air aloft and the relatively warm sea surface temperatures can stimulate the formation of showers and thunderstorms. These, in turn, may congeal around a weak surface low and help give it a symmetric, warm-core structure — and sometimes even a cloud-free, eye-like feature. Often a medicane's warm core will be enveloped within broader cold-core features, which makes it more akin to a hybrid or subtropical storm than a tropical storm. Henson writes that such storms typically develop once or twice a year, usually in the fall or winter, and tend to crop up in two places: the western Mediterranean, and in the Ionian Sea, southeast of Malta and Italy. These low-pressure storms are also simply known as subtropical cyclones, the Weather Channel says, and they share characteristics with both tropical and non-tropical systems: "a broad wind field and generally low-topped thunderstorms displaced from the center of the system. There also are no cold fronts or warm fronts." So what do we call the storm that hit Greece? That's the name it was given by the Free University of Berlin, which runs an "Adopt-A-Vortex" program, whereby anyone can pay to name an upcoming high or low pressure system. But no way, José: special characters aren't allowed, except for German umlauts.